Did you know that 20th January 2015 marks six years since Katy launched Chichester Copywriter? In the last six years Katy has worked with some fantastic clients throughout the UK including Cambridge International Examinations, The National Trust, Asda and Annie Haak Designs. Since Chichester Copywriter began, Katy has proofread marketing materials, business proposals and training manuals for charities, universities and international companies. She has edited fiction and non-fiction books for independent authors, one of which is selling brilliantly worldwide. Chichester Copywriter has supplied copy to the UK’s second largest supermarket chain, a popular jewellery brand worn by models and celebrities and a successful IT services company. What’s more, Katy has organised two writers’ retreats and co-founded Story Factory Chichester, a creative workshop for children. It’s traditional to mark a sixth wedding anniversary by giving a gift of iron or chocolates whereas the more modern choice is to gift something made of solid wood. With this in mind, Chichester Copywriter is offering a super-sweet gift to you that’s hard to beat and even harder to refuse – see what we did there?! 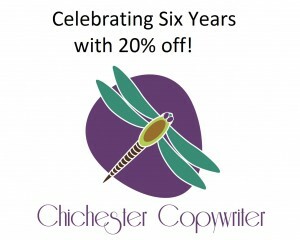 To celebrate six years of Chichester Copywriter, we’re offering you 20% off copywriting, copy-editing (marketing materials, non-fiction books and fiction books) and proofreading services as well as 20% off Social Media Marketing training (training for individuals and small businesses on how to get the most out of Twitter, Facebook, LinkedIn and Pinterest). This special offer is only valid for new enquiries on new projects throughout January 2015 but is applicable to existing clients. 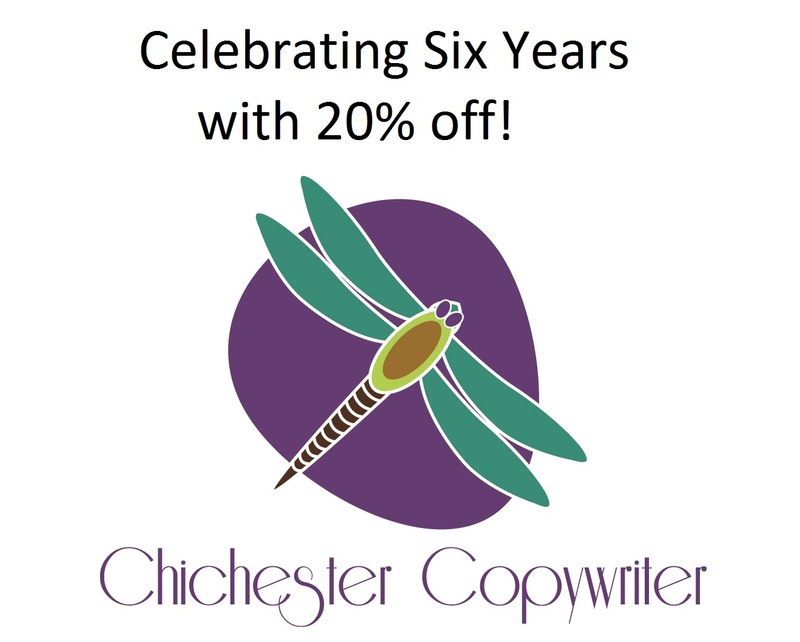 To receive 20% of Chichester Copywriter’s services and start the New Year as you mean to go on, contact Katy to book a consultation by 31st January, 2015. Please mention “Celebrate Six 20%” at the time of enquiry. Terms & conditions apply. This entry was posted in Chichester Copywriter News, Chichester Copywriter's Marketing Tips and tagged 20% off social media marketing training, Annie haak Designs, Asda, business proposals, Cambridge International Examinations, Chichester Copywriter, copy-editing, copywriting, Facebook, independent authors, LinkedIn, marketing, Pinterest, proofread, proofreading services, Story Factory Chichester, The National Trust, Twitter, writers’ retreats. Bookmark the permalink. ← Willowhale Library to celebrate 40 Years!